Teen/Small Adult – Large Adult; the hat stretches. 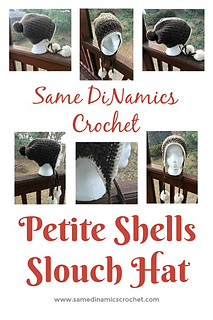 This Petite Shells Slouch Hat features an intriguing texture made just by using the petite shell stitch. It’s warm and comfortable, too! The use of yarn and stitches make this hat great for most sizes. The band and pompom ties add a whimsical touch. Magic Circle (MC) - See Cre8tion Crochet tutorial. You will fasten off after the body of the hat is finished. The band of the hat is worked in rows.